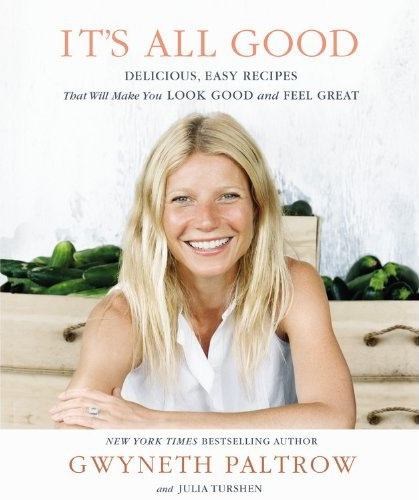 It's All Good is popular book on diet control by Gwyneth Paltrow, an Academt-Award winning actress of Hollywood. This book is all about delicious, easy recipes that will make you look good and feel great.In this book the actress has shared about the diet that she has followed while lossing weight, months back when she felt fatigued and faint. Her doctor adviced her to follow some diet plan, which restricted many of her favourit dishes. So finally she , along with Julia Turshen, compiled a collection of 185 delicious, easy recipes that followed her doctor's guidelines. The recipes of her diet include: Huevos Rancheros, Hummus Tartine with Scallion-Mint Pesto, Salmon Burgers with Pickled Ginger, even Power Brownies, Banana "Ice Cream," and more!